Super easy Chocolate Vanilla Cake with luscious Chocolate Ganache. 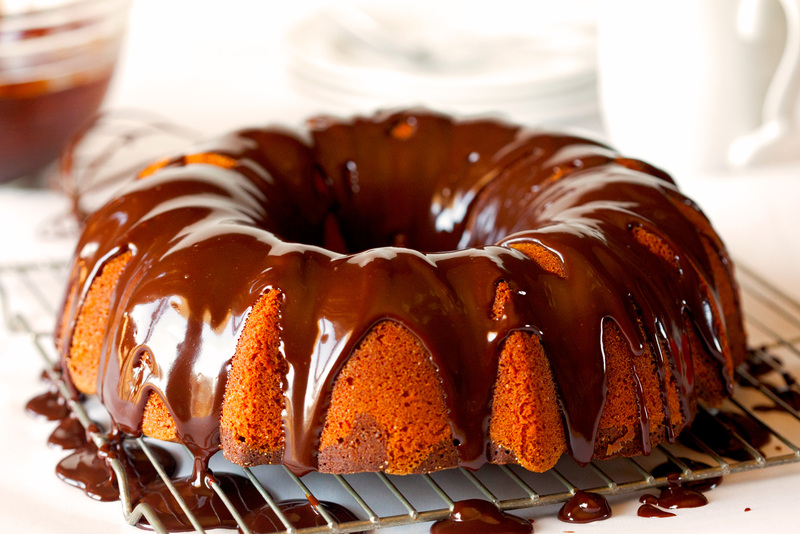 7 total ingredients is all you need to create this beautiful cake and luscious glaze. Whew. How did it get to be Monday already and how in the world are we in the middle of April? Is it just me or have the last couple of weeks been flying by? Like I mentioned on Friday, we attended a family get-together for Easter this past weekend and somehow started planning our summer. Lots of fun activities and mini vacations are in the work – it’s bound to be an eventful summer this year! I’ve already grilled dinner almost every night last week and had my first frozen yoghurt with a dear friend on Saturday. To say I’m excited about everything this warm weather has to offer would be an understatement. Let’s not mention that it began to snow as we were headed home last night. I am choosing to ignore the temporary dip in temperature at this point. Warm weather HAS to be inevitable! Another thing that was and is certain to happen many more times is this amazing cake. Because no matter what season we find ourselves in, I can always go for a slice of Chocolate Vanilla Swirl Cake with Chocolate Ganache. My affection with this cake seriously knows no bounds. Largely due to the best chocolate “glaze” in existence. 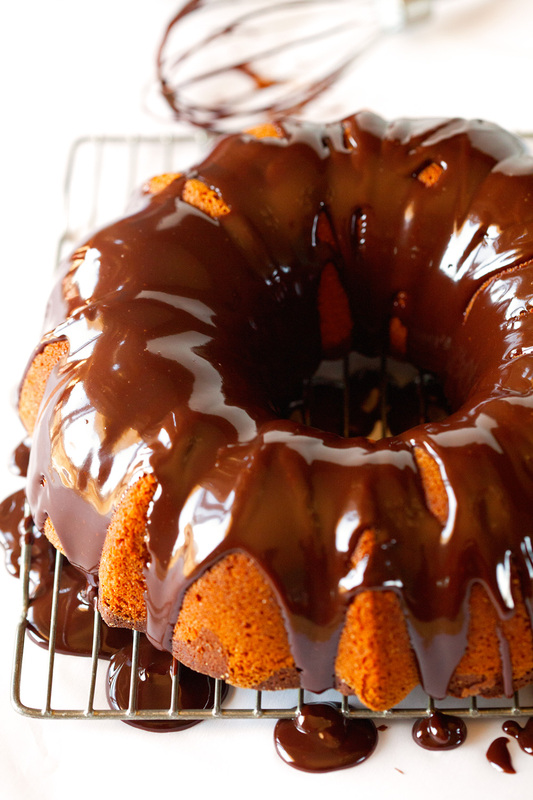 “Glaze” doesn’t do this ganache any justice. It’s a way of life, really. And don’t let the fancy word deter you. Chocolate Ganache is a snap to prepare. So is this cake. One bowl and five ingredients. It doesn’t get much easier than this. I followed one simple rule my mommy taught me. Lots of butter and eggs make for the most delicious cakes. As most of you know – moms always know best and this cake is definite proof. I have never tasted a cake that was so moist, buttery and more than indulgent. It’s unlike any cake I’d ever tried before. So simple and satisfying. Perfect for those times when you have unexpected company coming over or need an easy dessert that’s sure to impress. Or if you find yourself wondering why Mondays seem to come around so fast and need something to console yourself :). Let’s make this week a great one! 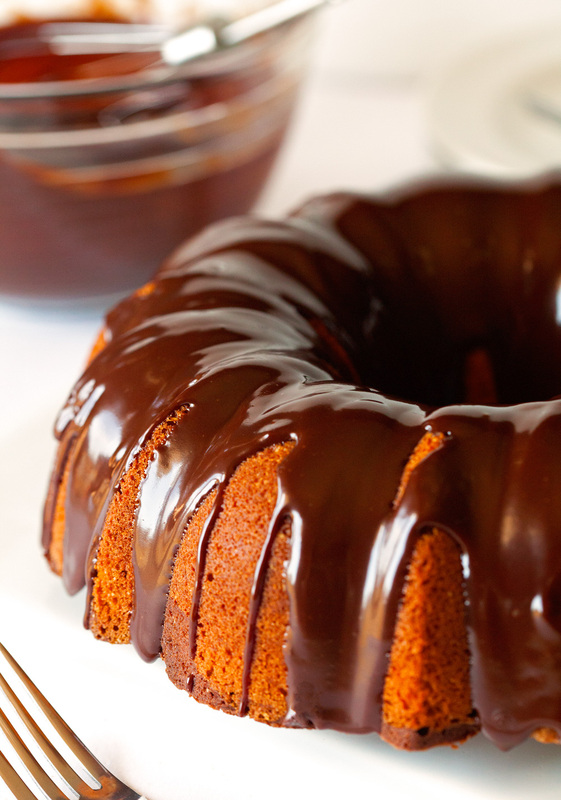 Make the easiest and most delectable chocolate vanilla bundt cake topped with amazing chocolate ganache. This cake is a crowd pleaser! Preheat oven to 350 degrees F. Thoroughly grease a bundt pan and sprinkle with bread crumbs or cornmeal. 1. In a medium bowl, cream together butter and sugar, using a hand mixer (you can also use your stand mixer). Add eggs and stir to incorporate. Next, add flour and stir until fully mixed in. 2. Pour 2/3 of the batter into the prepared bundt pan. Mix in cocoa powder into the remaining batter and pour on top of the white batter in the pan. Run a fork through the batter, crating the swirl effect of the cake. 3. Place bundt pan in the oven and bake for 60 minutes or until a toothpick inserted in the middle comes out clean. Remove from the oven and immediately invert onto a cooling wire. Let cool completely. 4. Once cake is cooled, prepare the chocolate ganache. Place chopped chocolate into a medium bowl. In a small saucepan, bring heavy cream to a boil. Pour over the chocolate and add a pinch of salt. Do not stir for 10 minutes. Once 10 minutes have elapsed, whisk mixture until smooth and creamy. Let stand for 5 minutes before pouring over the cake. Slowly cover cake with ganache and let stand for 10 minutes. The ganache will harden as it sets on the cake. My thought exactly – I would swim in this stuff if I could, ha! Thank you so much, Consuelo!! I love that this is so simple yet decadent and gorgeous at the same time. Thank you so much, Norma! 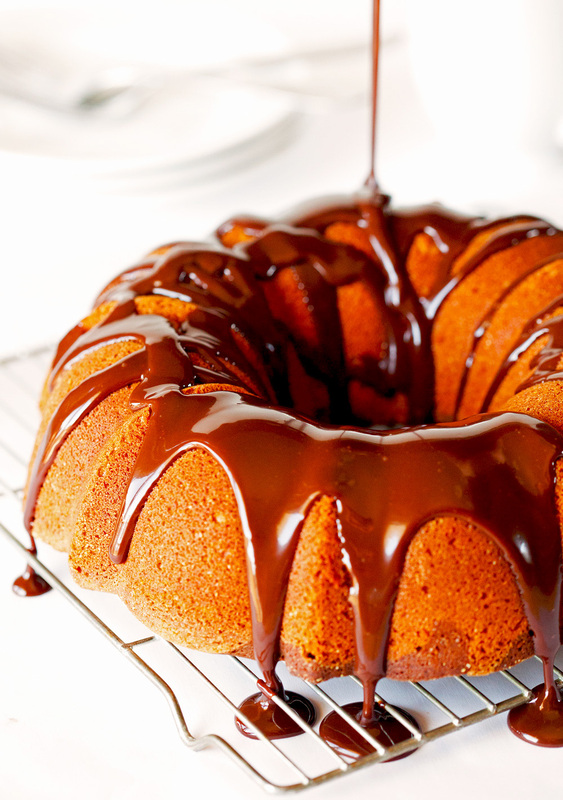 This looks divine- I love using my bundt tin for cakes! That chocolate ganache looks amazing too! Thank you, Jessica. I always love the way bundt cakes look – so pretty and they’re super easy to make! Oh, yeah! Love how moist and buttery it looks. And you can’t beat the chocolate glaze. So perfect! This looks beautiful! I am going to try a gluten free version! I love that, Annie. Let me know how it turns out – I’d love to hear!! I love simple baking recipes like this. Makes baking so much funner when it’s not a million ingredients and steps. 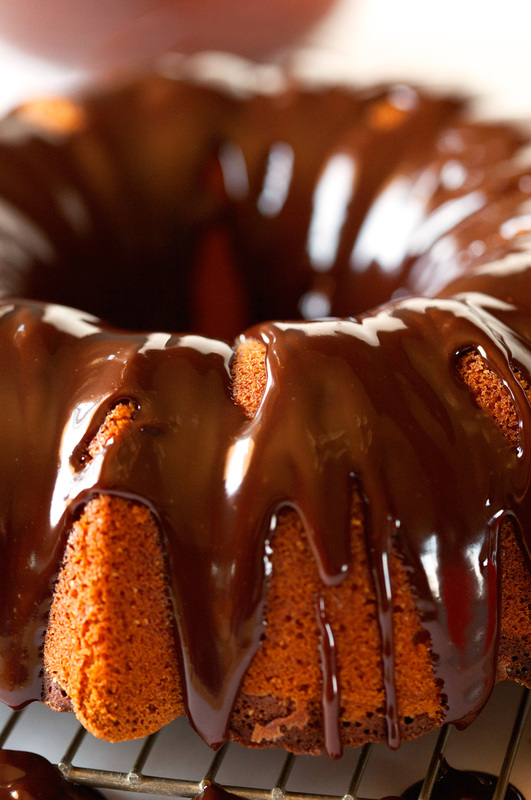 And can’t get enough of those drippy, melty chocolate ganache pictures! It’s amazing how fast time flies and how busy summer gets! This cake is gorgeous and only 7 ingredients?! Sign me up! Pinned! Isn’t it? I love busy summers, but I made sure we have enough time to relax and soak in the beautiful MN weather as well ;). Thank you, Julie!! That chocolate!!! And only five ingredients? Wowza. Cheers to a fun summer!!! It’s going to come so fast! Let’s hope so. I can’t wait for summer to get here :). Thank you, Nicole!! this looks so gorgeous girrrl! simple & perfect in every way – I’m thinking maybe a white choc glaze with funfetti sprinkles for an Easter twist? Seriously considering making that for my fam on Sunday! The chocolate ganache is calling my name. Beautiful bundt cake! Simple enough for me a non baker. 🙂 I think I’ll be bringing this to my sisters on Sunday. Definitely. It doesn’t get much easier than this cake :). Thank you so much, Kathy!! Love that you described ganache as a way of life. Well said!! 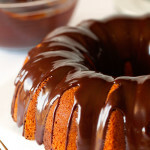 I like glazing bundt cakes because I secretly like getting frosting all over the counter. This looks beautiful!! Haha. I can’t think of anything better!! Thank you so much, Karen! 5 ingredients?! Whattttttt?! 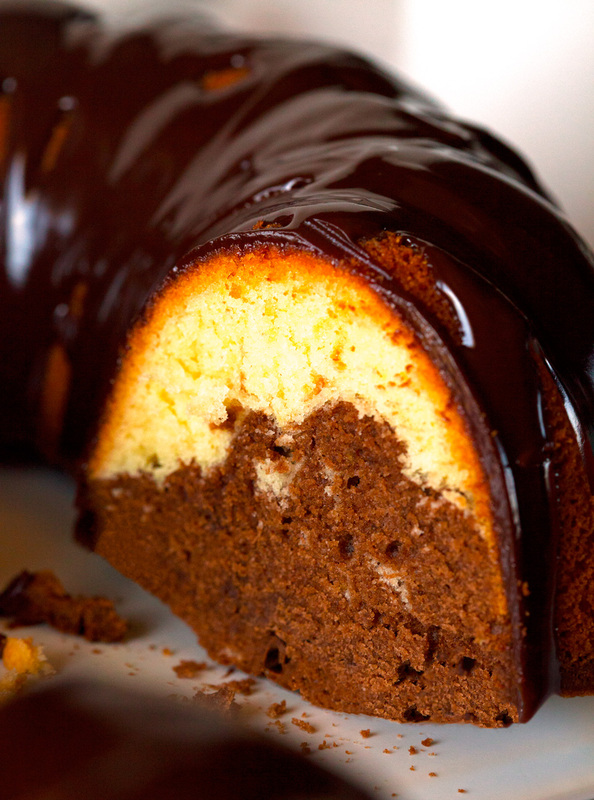 This is beautiful, just like everything else you make….and I totally agree that ganache is a way of life! I hope you had a fab weekend Kathi! Pinned! You are always the best, Justine! Thank you so much for all of your support and kind words. We had a great weekend. Hope you did too, maybe getting settled in your new place?? This cake is impressive in so many ways! Like 5 ingedients?! Heck yes! And that gorgeous, smooth ganache?! Ummm, yes please! Haha. I was just thinking the same thing – just picked out the perfect color to get my toes ready for some sunshine. I can’t believe only 5 ingredients! This is SO gorgeous Kathi! And I can’t believe how smooth your cake came out! Mine always comes out with little pieces missing. Is that why you used bread crumbs? Never heard of that! Pinned! It’s something my mom taught me when I started baking. She always said it’s the foolproof way to beautiful cakes. It works like a charm. Hope you try it sometime. And thanks for the pin, dear!! Chocolate ganache is amazing. It’s hard not to eat the entire thing by itself!! Thank you so much, Cindy! Thank you so much for your sweet comment, Kelly!! I think it’s perfectly sweet, but not overly so. Yes, it’s great with dark chocolate! I am new to your blog and I love it. I did this recipe yesterday for a friend for her nephew’s birthday and they love it. I will try it for myself later but thanks. Tried this recipe and this was the heaviest, driest cake ever…thinking maybe some baking powder was omitted. Made for hubby’s birthday, what a disaster!!! I would highly recommend checking this cake at 45 minutes. I left it the full hour and we basically had a chocolate swirl brick for my son’s birthday. I’m going to try scraping the ganache off and making a trifle of sorts tomorrow otherwise it just has to go in the garbage. The taste was nice though, not too sweet, and I was happy to that I had whipping cream and strawberries to serve with it to help with the dryness.